Inspired by Jeanie, who asked me on Facebook if I had a list of good Easter books for her to collect, here's our small collection. It's difficult to find Easter books that talk about the real meaning of Easter, isn't it? I've long wanted to make Easter as big a celebration in our home as Christmas, but our culture just doesn't help us do that. What is celebrated resembles spring, not the death and resurrection of Jesus Christ. But you know that. So let's start giving our kids some beautiful Easter memories, shall we? I respect your privacy. Period. affiliate links below because I love this! I apologize for the back-to-back posts about books we are currently loving, but I am so excited to share this one with you and just couldn't wait! In fact, we were talking about resources for Lent and Easter yesterday on the Preschoolers and Peace Facebook page, and then woohooooo! I got an email from Amanda telling me that her new Easter book is ready to go! If you've used Truth in the Tinsel in your home, then you know how great Amanda's work is for our younger kiddos. Simple truths, easy on Mom, and simpler activities. Win, win, win! 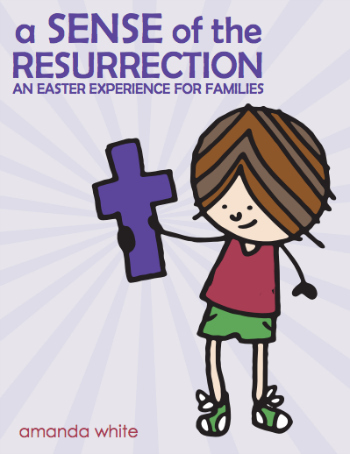 It's called A Sense of the Resurrection: An Easter Experience for Families, and each activity focuses on one of the five senses - smelling the perfume Mary used to anoint Jesus' feet, hearing the rooster crow after Peter's denial . . . It's only 12 activities, instead of 24. It's a little heavier because it is about something so serious, so think about what your littlest kiddos can handle. The activities are not just crafts, they are big memory-makers, like making bread for the Last Supper and sparkly window catchers to remind you of the bright angel who rolled Jesus' stone away. I'll also be posting our pics and other sweet observations from our little journey doing this together on both the Facebook page and the Google+ page. I'd love it if you'd join me!